The SEO and marketing gig is a tough racket. There’s plenty of competition, and even if you dwell in a lucrative niche that isn’t teeming with too many players, you still need to get people’s attention. Here’s the bottom line: you need to be able to entice people to check out your content if you want to advance. But how enticing should your titles be? You may be offering the highest-quality content in your niche, but if people aren’t at least curious, they’ll simply miss out. The title, in most cases, is the first thing they’ll read about your content, with the brief description following that. People are bombarded with flashy titles and images, and new information is always flooding into everyone’s psyche, fueling our dopamine and adrenaline to make us crave more. User attention is a highly sought after commodity. In fact, attention is the most coveted commodity on the world wide spider web, and it’s made us reluctant participants in the biggest social engineering experiment ever. The battle for attention has never been more heated, and everyone wants a piece. Maybe this is a stark reality, but we’re not going to discuss the ethical implications of a market oversaturated with clickbait and fake news. So, instead of going the traditional route of either praising or panning clickbait titles, we decided to list some pros and cons and let you form an educated opinion whether you should use them or not and just how “clickbaity” they may need to be. If your titles are overly outrageous and over the top, you won’t even get people to click, and the title will have the opposite effect. Many have been fed up with ridiculous sensational titles and will make an effort to avoid titles that are just blatantly attention seeking. It means what you think it means: bait for clicks. It’s a link which entices you to click on it. The “bait” comes in many shapes and sizes, but it is usually intentionally misleading and/or crassly provocative. Clicking will inevitably cause disappointment. Clickbait is usually created for money. UD is often a good gauge of general public sentiment, and we can see it’s not very positive in this case. Disappointing the visitors – Promising something to be “mind-blowing” or “unbelievable” runs the risk of not living up to expectations. Since you’re probably not onto a quick fix for global warming, chances are it doesn’t warrant the description of “unbelievable”. Another example is promising something to be the “cheapest”, only to discover the price is pretty average… or that something’s free, only to discover hidden fees or a sneaky condition to get that “free” something. If you promise something huge or amazing, you’d better make a candid attempt to deliver high-quality content to match the promise (or at least come close). If there’s anything that smells iffy to Google, it’s high bounce rates. If they detect that people don’t stick around your promoted webpage and instead return to search results, then theyll intercept it as content that doesn’t match the searched keyword, and this makes them upset. Eventually, this will start effecting your ranks negatively. You don’t want to upset Google, do you? Lowering trust – If you take marketing seriously, then brand building should be an integral part of your plan. Nothing damages a brand more than low approval rates. People will simply start avoiding your brand if they start associating it with deceptive clickbait titles that don’t deliver what they promised. There seems to be a paradigm shift against clickbait – Everyone’s BS detectors have become slightly sharper thanks to the fake news awareness of the last few years. More people are vigilant of misleading titles and are less trusting in general. They work – After all is said and done, if it’s done correctly, they make people click. They tug on our curiosity and our desire to know more. A creative, well-phrased, clever title will draw traffic. This is a proven tactic that’s been used countless of times, and the main reason we still see clickbait titles is simple – they’re effective. That’s effectively the foot in the door and the first step of whatever sale you’re trying to make. Whatever happens next is up to you. To set an example, we have BuzzFeed. Now, mind you, this isn’t an example of high-quality content, but just a case to show that clickbait works. BuzzFeed may host cheap content, but they basically made clickbait a commercial art form and became a 1.5 billion dollar company. Rules of the game – If everyone is playing a certain way and using heavy-hitting titles, you simply can’t ignore that. Everyone is trying their best to attract visitors and readers, and if your titles are dull and uninviting, you will be left behind – even if your content is superior to your rivals in the niche. It’s what we are used to – It’s nothing new, and no one is truly that upset or surprised to see them. Enticing titles have been used in marketing ever since there was marketing, more or less. We’ve been conditioned for more than two centuries to accept them, and as a result, we became desensitized. So most are generally ok with them, even if they don’t fully approve. It’s an acceptance of a tolerable nuisance. It’s your moral responsibility to win – You might not like the notion of using clickbait, but you need to stand out among your rivals who do use clickbait. If you truly and honestly believe in the benefits of your service and content over everyone else’s, then your job is to get that content out there. In a way, if you truly offer high-quality content, it even becomes your duty to make enticing titles to “save” the people from your inferior competition. Since the topic itself is fairly interesting and relevant for many people, it’s hard to mess up the title. Even if you try hard to make it bland, it still might attract readers. These are just the rules of the game these days, and if you want to have a fighting chance, you need to get your foot into people’s doors of perception. So, how can we define a clickbait title? 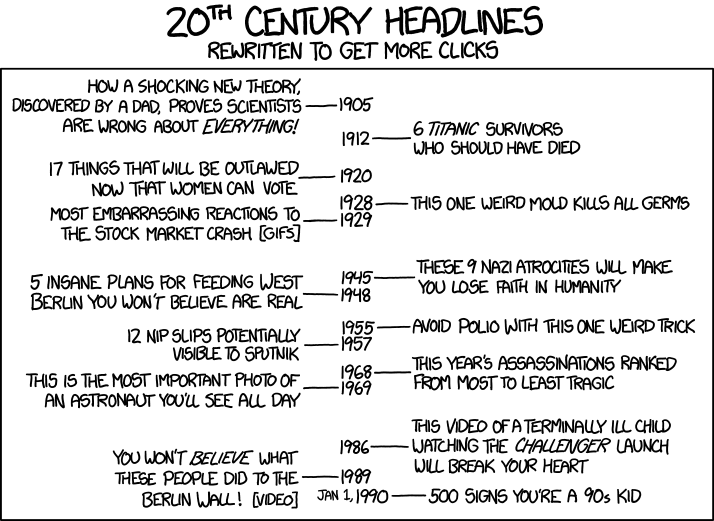 One way is to consider it on a sliding scale instead of using a binary definition: “clickbait” vs. “not clickbait”. So, on one end we have titles which are purely informative and “bland”, and on the other end we have clickbait-y and “spicy”. Like with food, you can’t have your meal too bland or too spicy. People won’t reorder the meal, they’ll lose interest in the other dishes your restaurant offers, and they’ll start giving you 1-star reviews on Google’s Snack Pack (which we can also track, by the way). You’ll likely be forgiven for one exclamation mark, one question mark, and one word in caps. More than that, and you risk over-spicing the dish. Next, we have the issue of delivering what was promised. The problem often lies in the level of mismatch between what’s expected given the hyped title and what’s actually delivered. Since this is subjective, you won’t always be able to hit that sweet spot of matching expectations with reality. 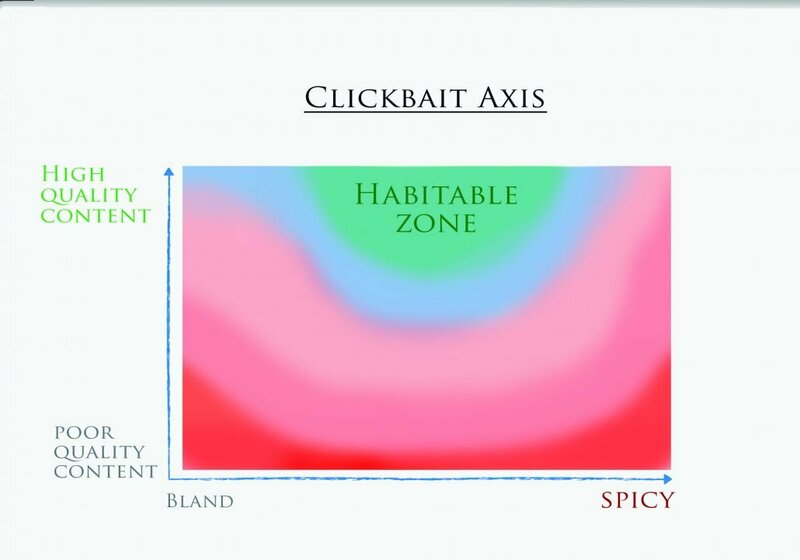 Which is why we have another axis to the clickbait scale – the content quality axis. Not only does the title need to be clever and enticing, but the content needs to match what was promised. Luckily, the content doesn’t have to match 100% of expectations, it just needs to be in the vicinity of the “habitable zone”. The cons we listed above are mostly relevant when you hit those spicy notes too heavily. Stay in the comfy middle, and this is where the pros are. This isn’t science, just a subjective view, so it’s up to your healthy judgment to place your titles and content in the “habitable zone” in the middle of the scale. Anything outside the “zone” will have poor chances of survival. Eventually what matters is making an effort toward creating great content, and ideally, people will visit regardless of titles and just because they will know they can trust you to give them high-quality content. Now let’s talk about what Google does with webpage titles and why it’s important that you keep track of your webpage titles in the SERP for your keywords (as well as your ranks). So, you finally came up with an amazing title that you want to drive to the top of Google’s SERP, but what you may not know is that Google might truncate your title or even change it altogether (in some rare cases) to suit some search query. Contrary to what some might think, the length of the title is limited by actual pixels and not the number of characters. This makes sense since we have letters that are just too thin, like “I”, that contribute to an unhealthy body image for the other letters. We also have “R” – average in width and proud of its slightly thick nature, it rolls nicely on the tongue, is favored by pirates and doesn’t sound nearly as self-centered as “I”. Google never officially published their widths, and they also change it occasionally, making it slightly wider or narrower. But we know from experience that if you really want to stay 100% in the safe zone, keep your titles below 54 characters considering the average use of letter variety and spaces. As for their occasional changes of your titles to better suit a search query, the only surefire way to know is to simply track it along with your ranks on PRT. For better or worse, clickbait titles are here to stay. You need to not only find the correct balance, but also make sure Google displays your titles correctly on their SERP. If you follow these two guidelines, your titles should be safe! Make sure you’re subscribed to our blog so you won’t miss out on any search engine tips and news. Google – all known ranking layers, including exclusive layers only PRT can handle. Plus search volume revealed. Believe it or not, this isn’t a misleading clickbait title. We’re the only ones that offer a real free trial of our rank tracker with no credit card details needed to activate it and with all our features unlocked. We don’t want to bait our users or scalp from auto-renewal traps. We have full faith in our tech and know that it will speak louder than anything by letting users experience it themselves, for FREE. After that (and ONLY if you choose), you can sign up for the one affordable monthly rank-tracking plan on the market, starting as low as $17 USD a month for a 300-term quota. Refer to us via our Affiliate Program. There is a very neat reward if you do! People will see their real search engine ranks, and it’ll all be thanks to your tip.